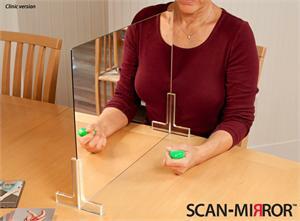 Scan-Mirror Modality is specially designed for upper extremity Mirror Visual Feedback (MVF) therapy. NEW! Included with the Clinic/Professional version, is the newly designed Scan-Mirror(tm) Laterality Cards! Optimal size for upper extremity mirror therapies. Allows for full range of motion exercises. Unrestricted view of the patient by the Medical Professional. Super-elliptical shape features safe rounded corners and smooth edges. Unbreakable mirror; wont shatter even if dropped. Two stands/feet can be adjusted for optimal positioning and removed for easy storage. The reflective surface of the mirror is approximately: 15x19 inches (38 x 48cm). Smooth edges and rounded corners allow the patient to work comfortably in both horizontal and vertical movement planes, from the table surface all the way up to shoulder height. The mirror is glass-free and made from durable plastic with a reflective coating on one side. Two removable stands/feet secure the Scan-Mirror in an upright position. Mirror therapy is a relatively new rehabilitation treatment method. Published scientific research claims [footnote 1] about mirror therapy relate to both neurology and hand therapy. Mirrors can be used in the treatment of phantom pain, nerve injury, Complex Regional Pain Syndrome (CRPS), Arthritis and other diagnoses. As part of an overall treatment program, mirrors should only be used by trained medical professionals. Two removable Stand/Feet can easily be placed in different positions. Non-Returnable (once the protective film has been removed from the mirror surface). Tristan L. Hartzell, MD, Roee Rubenstein, MD Mojca Herman, MA, "Therapeutic Modalities - An Updated Review for the Hand Surgeon", Journal of Hand Surgery, Vol 37A, March 2012. Elisabet Hagert, MD, PhD, "Proprioception of the Wrist Joint: A Review of Current Concepts and Possible Implications on the Rehabilitation of the Wrist", Journal of Hand Therapy, January-March 2010, pp. 1-16. V. S. Ramachandran and Eric L. Altschuler: "The use of visual feedback, in particular mirror visual feedback, in restoring brain function", Oxford Journals, Medicine, Brain, Volume132, Issue7, Pp. 1693-1710. Birgitta Rosen og Goran Lundborg: "Training with a mirror in rehabilitation of the hand", Scandinavian Journal of Plastic and Reconstructive Surgery and Hand Surgery, April 2005, vol. 39, no. 2, pp. 104-108(5). Nicole Grünert-Plüss, Ursina Hufschmid, Lilian Santschi, and Jörg Grünert: "Mirror Therapy in Hand Rehabilitation: A Review of the Literature", the St Gallen Protocol for Mirror Therapy and Evaluation of a Case Series of 52 patients, The British Journal of Hand Therapy, Spring 2008 Vol 13 No 1.